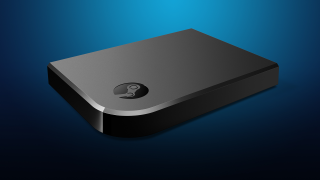 A personal review of Valve’s home streaming device. I’ve never been a couch gamer. For me, PC gaming has always been something that happens while sat upright at a desk. But when I saw the Steam Link on sale recently for a very reasonable £16, I decided to give it a go. I already had the Steam Controller and thought it would be nice to complete the set. But I didn’t really know what to expect, or if the thing would even work on my home network. I usually research technology until I’m sick of reading about it before I buy it, but this was purely an idiotic impulse purchase. I forgot I’d ordered it until I received a shipping notification from Valve a couple of days later. Then, knowing a new toy was on the way, I started to get excited. I looked at the layout of my living room and realised that because my router and TV are in opposite corners, I’d either have to trail an ethernet cable across the room, or use the Steam Link wirelessly. And knowing that Valve itself recommends a wired connection, I wondered if my router, a decidedly entry level BT Home Hub 5, would be up to the task. So I asked Twitter if anyone had successfully used the Steam Link over a wireless network, and the responses were encouraging. It clearly didn’t work well for some people, but others said it was fine, particularly for slower games. My router supports 5GHz wireless, so I thought that might give me the edge. And if not, well, I guess I could buy a long ethernet cable. But I wanted to avoid that if possible. Another two days pass and the Link finally arrives at my house from a warehouse in the Netherlands. I sign for it, noting that the box is surprisingly heavy, then begin the process of setting it up. This is self-explanatory and I don’t need the manual. I connect the power, run an HDMI cable from the Link to the TV, then plug a controller into the USB port on the side—in my case, the Steam Controller’s wireless dongle. Then, after entering an identification code that appears on Steam on my PC, I’m good to go. I connect to my router’s 5GHz wireless frequency and watch as Big Picture Mode fills the screen. I notice that the TV is essentially mirroring the image on my monitor behind me, which is kind of distracting, so I switch it off. The menus are responsive and feel the same as they would on a PC with a wired controller, but the real test will be playing a game. There are three stream quality settings—fast, balanced, and beautiful—and I opt for balanced. Then after trying a few games at 1080p, including Abzu, Deus Ex: Mankind Divided, and Portal 2, I’m actually amazed by how well it’s working. The image quality isn’t as crisp as on my IPS monitor, but sitting a couple of metres away on the couch, it doesn’t really matter. Occasionally I notice some ghosting, but whenever it happens it’s only for a few seconds—or maybe my eyes just get used to it, it’s hard to say. And, more importantly, I don’t see any dropped frames at all, which was my biggest concern. You might not be so lucky, of course. I’ve read horror stories about games running like a slideshow when streamed over the Link wirelessly. But my router, despite being one bundled with my broadband package, is handling the task with impressive gusto. The relatively small size of my living room probably helps, as does having a 5GHz connection. Apparently it’s less congested than the older, busier 2.4GHz frequency, but I’m no network expert, so I’ll stop talking about this now before I embarrass myself. It’s been a week since the Link arrived, and I’ve spent around 2-4 hours a night playing it. And one of the most interesting things I’ve noticed is how it puts me in the mood for different games than if I was at my desk. There’s something intense about sitting at a desk playing a game. You’re sat up straight, staring at the screen, never really relaxing. I’m playing the fantastic Tides of Numenera at the moment, and that’s a real desk game. Lots of text to read and challenging, tactical turn-based battles to concentrate on. But when I’m sinking into the couch with my feet up, I suddenly feel the urge to play something simpler, slower. So rather than use the Link to play Doom or Dishonored 2, which feel more at home on my monitor, I’ve been enjoying the leisurely pace and immersive atmosphere of games like Firewatch, Abzu, Inside, The Long Dark, Broken Age, and the underrated Sherlock Holmes: Crimes and Punishments. I’ve finished these games before, but playing them on the Steam Link, reclining with a cold alcoholic beverage and a wireless controller, I’ve somehow enjoyed them even more. I’ve also noticed the Link having a positive impact on my terrible attention span. When I’m playing at my desk I’m forever alt-tabbing to check Twitter or any number of stupid distractions. And I’ll usually last an hour in a game before quitting and doing something else. But camped out on the sofa, my attention doesn’t wander as much. I pay more attention to what I’m playing, and play it for longer, which is a discipline I thought I’d lost. It’s also a lot more sociable. I normally play games on my PC in the corner of the living room with headphones on while my girlfriend does something else. But she joined me on the sofa and watched me play through the entirety of Firewatch over the course of a few nights. And she became hooked on the story to the point where I couldn’t play it unless she was there to see what happened next. Gaming’s always been a personal hobby, because she’s not really into it, so it was cool to share that experience with her. And now I’m thinking about what other games a non-gamer might enjoy watching, which is another surprising way the Link has informed what I play. I’m basically really impressed with the Steam Link. It’s always nice when a spur of the moment purchase turns out to be a good one, and I’m enjoying the new perspective it’s giving me on some of my favourite games. Your experience may vary, so it might be worth researching your network situation before investing, but for me it works a treat. If you own a console and regularly spend time playing games away from your desk, you won’t get as much out of the Link as I have. But if you’re a stalwart desk gamer like I used to be, you might be surprised by how eagerly you’ll embrace couch gaming, and how it may change your approach to PC gaming in general.